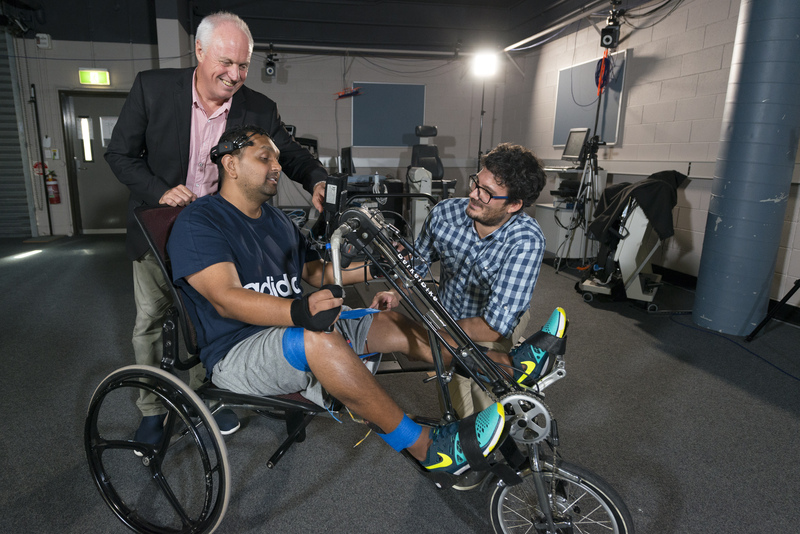 Griffith medical graduate and Gold Coast University Hospital junior doctor Dinesh Palipana thinks about walking a lot, since a car accident left him a quadriplegic part-way through his medicine degree. Now he’s thinking about pushing the pedals of a specially-adapted recline bike, and thanks to electronic muscle stimulation, he’s actually moving, in what is the first step towards a world-first integrated neuro-musculoskeletal rehabilitation program, being developed at the Gold Coast Health and Knowledge Precinct (GCHKP). Now he’s thinking about pushing the pedals of a specially-adapted recline bike, and thanks to electronic muscle stimulation, he’s actually moving, in what is the first step towards a world-first integrated neuro-musculoskeletal rehabilitation program, being developed at the Gold Coast Health and Knowledge Precinct (GCHKP). Griffith biomechanical scientists and engineers Professor David Lloyd, Dr Claudio Pizzolato and his team, together with Dinesh as both researcher and patient, are aiming to use their ground-breaking 3D computer-simulated biomechanical model, connected to an electroencephalogram (EEG) to capture Dinesh’s brainwaves, to stimulate movement, and eventually recovery. “The idea is that a spinal injury or neurological patient can think about riding the bike. This generates neural patterns, and the biomechanical model sits in the middle to generate control of the patient’s personalised muscle activation patterns. These are then personalised to the patient, so that they can then electrically stimulate the muscles to make the patient and bike move,” says Professor Lloyd. “It’s all in real-time, with the model adjusting the amount of stimulation required as the patient starts to recover. Dr Palipana is excited to be part of such novel research in his own backyard. “I have a selfish and vested interest in spinal cord injury research and I’m completely happy to be the guinea pig,” Dr Palipana says. “We’ve had equipment for many years where people passively exercise using stationary bikes, and stationary methods where people get on and the equipment moves their legs for them. The problem is you really need some stimulation from the brain. This top down, bottom up approach is novel, with the model effectively providing a substitute connection between the limbs and the brain where it was previously broken when the spinal cord was injured. The neuro-rehabilitation research will dovetail with exciting research by Griffith biomedical scientist, Associate Professor James St John, who has had promising results for his biological treatment using olfactory (nasal) cells, to create nerve bridges to regenerate damaged spinal cords. “You use the modelling to recreate the connection, and over time, with the science of Associate Professor James St John, you establish new neural pathways. So over time patients will be less dependent on the model to control the bike movement and it will move back to their own control, with their regenerating spinal cord and their reprogrammed neural pathways,” says Professor Lloyd. Associate Professor James St John hopes to move into human clinical trials in the GCHKP within the next 2-3 years, and in parallel Professor Lloyd and his team hope to refine their rehab testing with Dinesh, and develop the technology with leading global companies in exoskeleton design. These companies, could in turn, be attracted into the 200-hectare GCHKP. “In ten years we want to be a one-stop shop for spinal cord injury and complex neurological patients,” Professor Lloyd says. “I’m just really lucky to be well-positioned here where it’s all happening and I want to be involved as much as possible as a doctor and a potential scientist,” says Dr Palipana. Asia-Pacific’s emerging health and innovation hub, the Gold Coast Health and Knowledge Precinct (GCHKP) is a unique global business location for high-tech industry development, research collaboration and jobs of the future, with over nine hectares of prime greenfield land available for investment as a key legacy of the Gold Coast 2018 Commonwealth Games.